Here’s a quick how-to for anyone who wants to split their computer screen monitor into two so that they can view two applications side-by-side. I’ll also be talking about how you can split your screen across dual monitors and split your wallpapers so you can have a different wallpaper on each monitor. The first how-to is really only useful if you have a widescreen computer display. Otherwise, splitting a normal monitor will not leave enough real estate for the two applications. However, if you have a 15″, 17″ or higher widescreen display, you can easily split the single monitor. And the best part for splitting on one monitor is that you don’t need any software application, you can do it for free using the built-in options in Windows. In this article, I’ll show you the process in Windows XP and Windows 7, the latter being the same as Windows 8. So in order to split your display down the middle either horizontally or vertically, first open two applications, let’s say Word and Excel. Now click on one of the tabs in the Windows Taskbar and then press and hold the CTRL key on your keyboard. While holding down the CTRL key, click on the other tab in the Taskbar. They should both be selected now (they should have a darker background than the other tabs). Now that both applications are selected in the Taskbar, right-click on either one and choose Tile Vertically from the options. And viola! 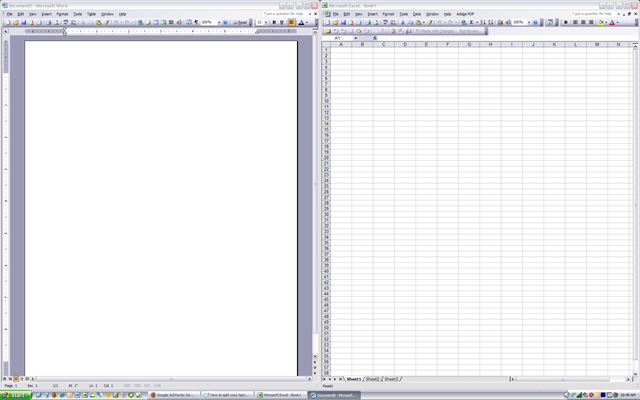 You should now have Word on one side of the screen and Excel on the other side! If you want them in landscape view rather than portrait view, just choose Tile Horizontally. You can also split your screen three ways or more by simply selecting more applications in the Taskbar! Pretty easy! So that’s what is involved to split your screen if you have one monitor. If you have more than one monitor, you won’t be able to split programs on the second monitor using Windows XP or Windows 7. Both operating systems support multiple monitors, but they simply extend the current desktop out to the extra monitors. This means you will only have one taskbar and you can drag applications to the other monitors, but not split them using the method described above. In Windows 8.1, each monitor can have its own desktop and you can split multiple programs across multiple monitors. In Windows 7 and Windows 8, you no longer have to follow the Windows XP procedure for splitting windows because there is a new feature called Snap. Using Snap, you can just drag windows around the screen and they will “snap” into place. Drag a windows to the far left, far right or to the top and you’ll suddenly see this translucent frame appear on the screen. As you can see, the window will take up half the screen on the left side because I dragged the window to the far left side of the screen. Now all I have to do is take another window and drag it to the far right and it will automatically fill up the right half of the screen. You have just split your screen in Windows 7/Windows 8! If you are running Windows 7 with multiple monitors, you can use this dragging technique to split programs on the additional monitors too. In Windows 8, you can do the same thing, but you’ll actually have a separate taskbar for each monitor. If you are using Windows 10, there are a couple of great improvements to the snap feature that make managing multiple windows even easier. Make sure to read my post on the Windows 10 window snap features. These include Snap Assist and 2×2 grid view. The same post also mentions two freeware apps that you can use to split your screen in Windows. If you have more than one monitor, you can follow the same procedure as shown above for each monitor. That way, you would have four applications split across two monitors. Now if you’re kind of lazy like me and you would rather simply just click a button to split your screen, then you can buy a cool little program called SplitView for $39. SplitView basically makes a GUI interface for this built-in Windows feature by adding buttons to each window that you have open to move it to the left or to the right. You click the left arrow and that program gets split to the left and same for the arrow to the right. You can also configure keyboard shortcuts to make it even easier. Probably only worth the $39 if you really split applications all the time at your office or at home. Otherwise, just do it yourself by either clicking or dragging! Any questions, post a comment!